Whether you’re after fish in open water or through the ice, your lure presentation is one of the most important considerations for success. Since ice-fishing season is fast approaching in many areas, now is a good time to think about lure presentation as it applies to ice-fishing. Open water fishing and ice-fishing are similar, but very different as well. As far as differences, think of this. In open water fishing, much of the time, we’re either casting or trolling: The bait goes by the fish pretty quickly. They aren’t going to have much of a chance to look at it: They either eat it or it’s gone. If you show the fish the bait they want and how they want it, much of the time they’ll eat it. 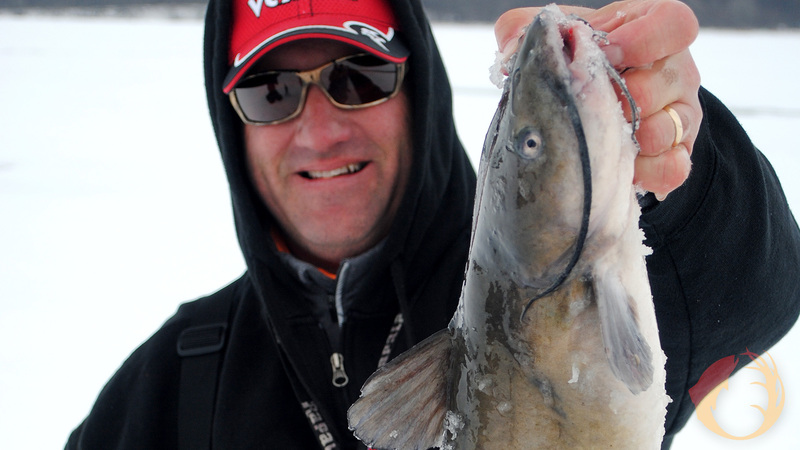 Here’s Clear Lake Iowa fishing guide Chris Scholl with a bonus channel cat that he took through the ice. When ice-fishing, the bait is almost stationary. We move it up and down a little bit, but mostly, the fish have a chance to take a pretty good look at our bait. At times in the winter the fish will be very selective. This is when we really need to pay attention to lure detail and action. The electronics used for ice-fishing today are remarkably sensitive. Vexilar is the pioneer in on-ice sonar, and continues to produce sonar that, simply put, will help you catch more fish. They’ll show a tiny splitshot on your line, and will reveal to you when a fish is looking at your bait. If fish come in, look, and leave more often than they eat your bait, you need to change your presentation, either a little or a lot. The first thing you should change is the action you’re putting on the bait. If you’re moving it slowly, try moving it a little faster. If you’re moving it fast, slow down a bit. If changing the lure action doesn’t get them to bite, go to a smaller or larger bait. Often, when the fish are being finicky, a change to a smaller bait will get them to bite. Tungsten has really changed jig dynamics. A tungsten jig, such as Northland’s Mooska Tungsten Jig, is smaller in physical size than a lead jig of a similar weight. Because of this, we can effectively fish a smaller looking tungsten jig in deeper water. Remember, fish see size, not weight. If changing the action or size of the bait doesn’t work, try a color change. Sometimes color doesn’t matter, but much of the time it does. There are more times than you might think that the fish respond better to a certain color or color pattern. Keep switching colors until the fish reveal what color they want on that particular day. And, every now and then, there are times when the fish under you don’t want to eat. Look for another group of fish, but don’t forget about the school of fish that you’re leaving. At some time during the day, they’ll probably turn on. When that happens, you’ll want to be there. Show them the bait they want and how they want it and you’ll increase the odds of catching them.